The Low C Hohner 365 Marine Band has some deep low notes and some amazing high end bends! This article details all the possibilities! 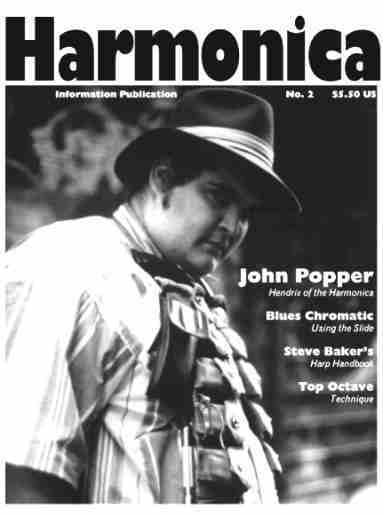 This regular feature looks at how thinking like lead guitar can give harmonica a new take on the blues. Second in a series. This time, we add the slide to D minor third position blues. We untangle the confusing high register, working with the blow bends and finding our way around the scale, looking at different classic approaches and figuring out new licks. The amazing 1928 recordings of George "Bullet" Williams get a close look, from his singing and screeching through the harp, to his astounding train piece with the five-hole tongue split! We look at finding chord shapes in the tuning. This concept takes us away from strict note patterns to dynamic actions that form "shapes". All available space gets scribbled on, and the inside back cover is no exception. Here we discuss how you can use the concept of talking as a way to become more fluent at improvising.